Fast drying, fast curing floor finish. 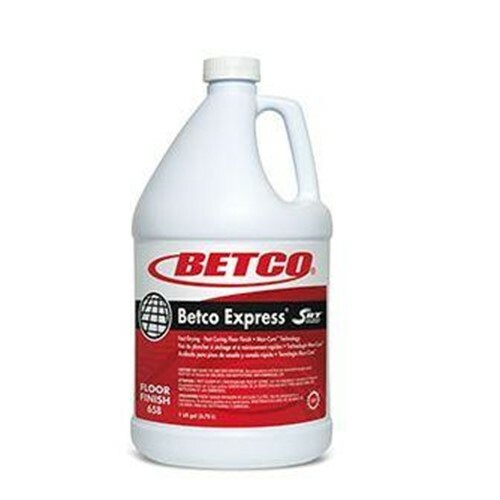 Betco Express floor finish utilizes highly durable internally cross linked polymers specially blended to minimize drying and cure times. Formulated with Max Cure Technology, each coat of finish dries and can be recoated in as little as 10 to 15 minutes. Up to 5,000 sq. ft. per gallon coverage. Can accept immediate airflow to accelerate dry time. Can be burnished between coats. Fast drying and curing allows rapid recoating. Apply up to 6 coats in one hour. Self Sealing and optically energized with XBF.